The minute I saw the Akitio Node Lite with Optane (there’s a 960GB Intel 905P Optane NVMe SSD inside), I started humming Prince’s Little Red Corvette. 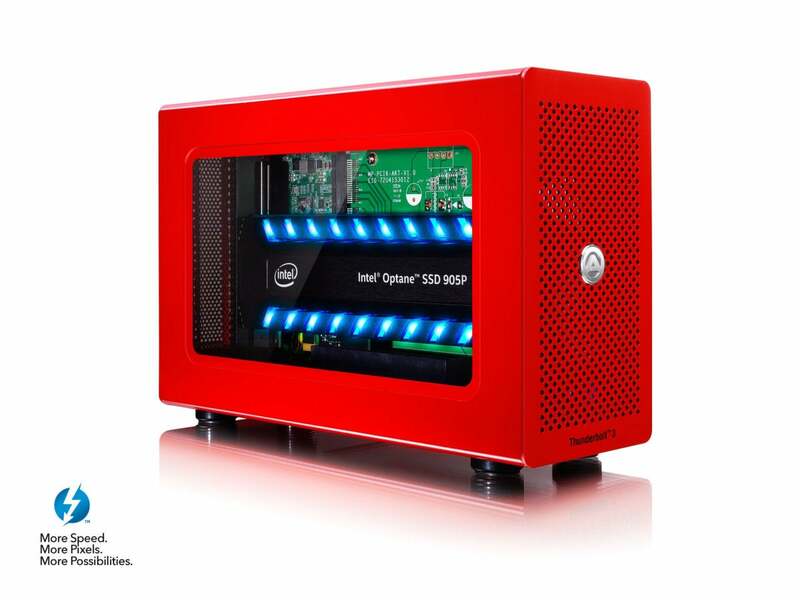 It’s that red, and with the well-lit 905P inside, makes for an stirring show. The combination also makes for top-flight performance, with transfer rates on the high side of 2GBps. I was also about to say that the Node Lite with Optane costs as much as a Corvette, but that wouldn’t be a fair comparison unless I specified a collectible such as a ‘63. Granted, $1,500 (available on Amazon) is hefty sum for a storage box, though the majority of that is the high-end 960GB Intel drive. A plain Akitio Node Lite without an SSD is $220 on AmazonRemove non-product link (as of this writing), which is still a bit pricey. If you don’t have Thunderbolt 3 on your PC, you should be jealous. PCIe over a wire (that’s Thunderbolt in a nutshell) can be handy for all sorts of things, such as adding a super fast NVMe drive to your system, or an external GPU. I only mention the latter, because Akitio specifically warns that the Node Lite, though fully rigged with an x16 PCIe slot, is not suitable for that purpose—it’s too small and underpowered for a full-sized graphics card. For eGPU use, you want the full-on Node. There is a plain brushed-metal version of the Node Lite, but this one is a special design in bright fire-engine (or Corvette) red for deep-pocketed enthusiasts. 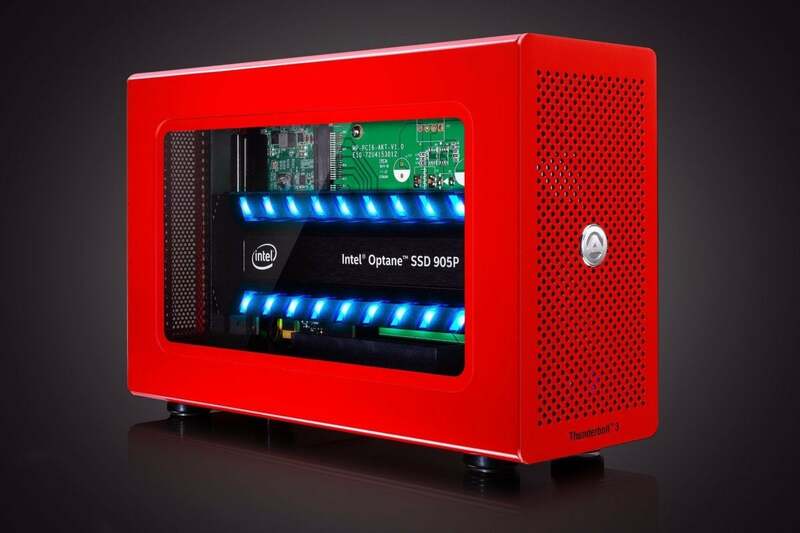 It shows off the LED lighting on the Intel 905P via a window on its left side. If you need to know more about Intel’s uber-fast, super enduring and super pricey x4 PCIe card 905P NVMe SSD, you can read about it here. The enclosure uses captive thumbscrews to secure the cover, which slides forward and off. It tends to get hung up slightly unless you jiggle it a little. On the back of the chassis are two Thunderbolt 3/USB-C ports, a full-sized DisplayPort connector, and the AC jack. 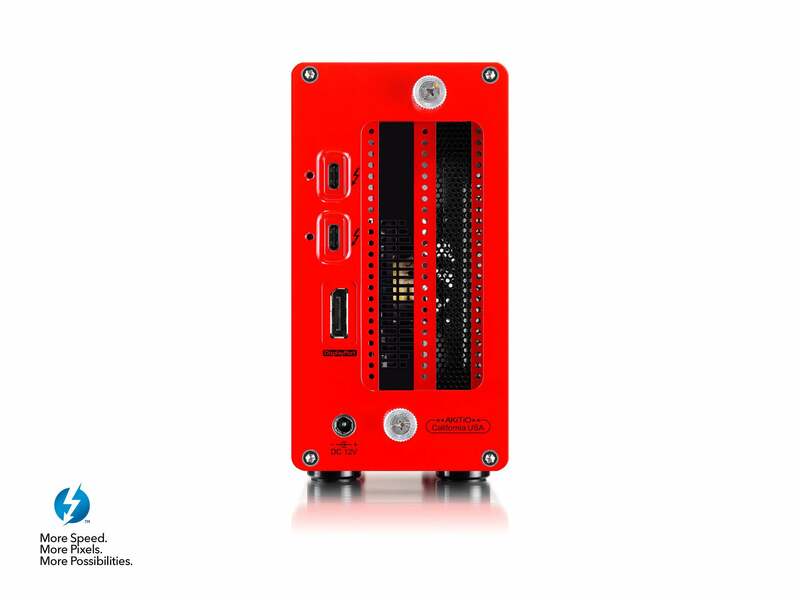 There’s no power switch: The enclosure will automatically turn on or off when it senses current, or lack thereof, on the Thunderbolt bus. Two Thunderbolt 3 ports, a single full-sized DisplayPort port, and the power jack adorn the back of the Node Lite. Inside is the aforementioned single full-length x16 PCIe slot. It’s nice that that the box accepts x16 cards, but Thunderbolt only supplies 4 lanes and we know of no mainstream NVMe drive that uses more than that. Cards are secured by screws at the top of the bracket, just as they are inside a full PC. Two thumbscrews are provided for wider cards, even though those would most likely be, yes, graphics cards. I tested the Node Lite (blue bars) alongside a similar product from HighPoint, the 6661A. I “borrowed” the 905P for the latter, in addition to testing it internally in our storage test bed. The 905P was a bit slower in the enclosures than the drive in the test bed, but the performance of the two enclosures was so close that you can safely ignore it in your purchase decision. 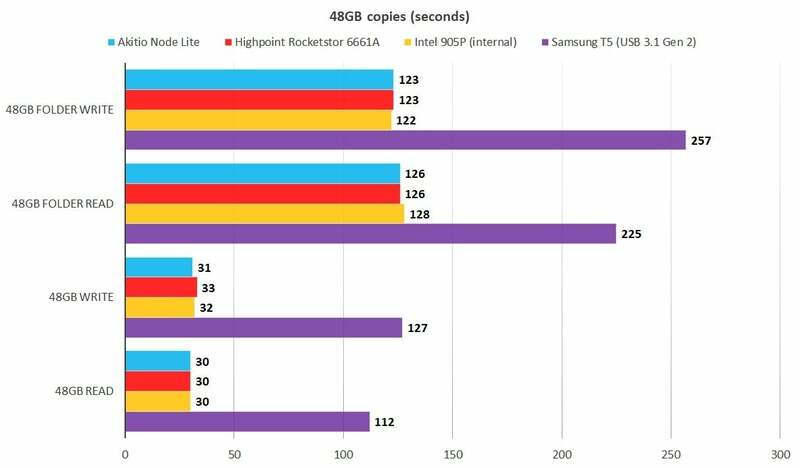 The Samsung T5 is included in the charts below to illustrate the huge performance advantage Thunderbolt 3/NVMe holds over the USB 3.1 Gen 2/SATA. The latter, however, is far cheaper and universally compatible. Thunderbolt, unfortunately, has barely made a dent in the Windows world. 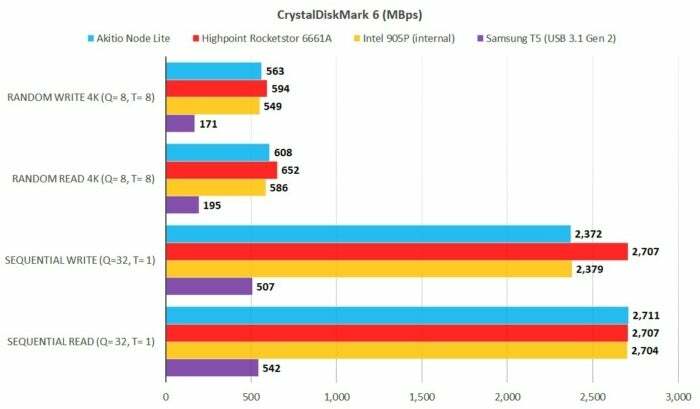 The HighPoint 6661A was faster than the Node Lite (blue bars) in several CrystalDiskMark 6 tests, but the differences aren’t noticeable in the real world. Still...Longer bars are better. 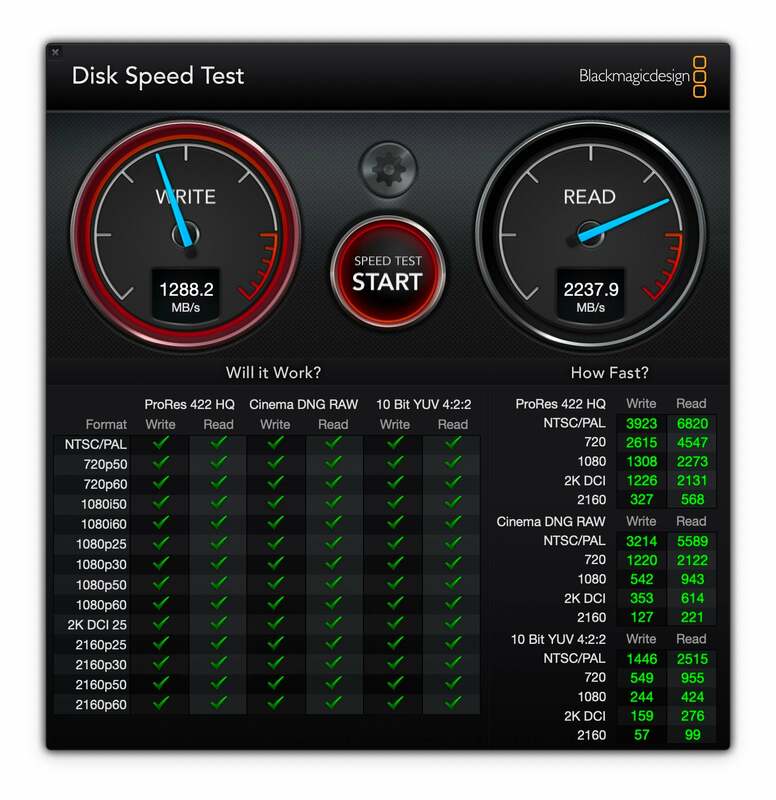 USB 3.1 Gen 2 SATA seek times, as shown below, aren’t slow. In fact, they’re lightning-like (see what I did there?) compared to hard drives, but Thunderbolt 3/NVMe’s are even quicker. 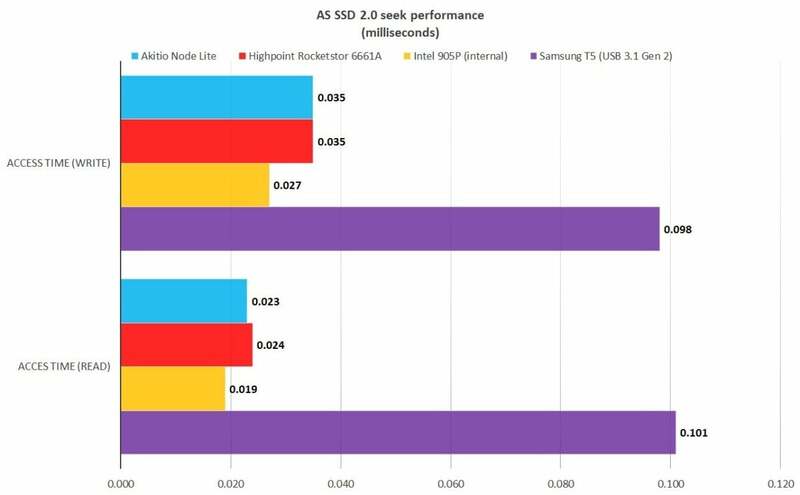 You don’t lose a lot of NVMe’s fantastic seek times by using Thunderbolt 3. Shorter bars are better. There was little to choose between the Akitio and the Highpoint, or for that matter the 905P operating in our testbed, in terms of the time it took to copy files. The Node Lite (blue bars) was faster in some tests, slower in others, but the differences were minute. Shorter bars are better. In terms of performance, the Node Lite and the 6661A are a pick-‘em. Both are easily fast enough that you could run your operating system from them and never notice the difference from an internal NVMe drive. Fast enough, in fact, that your backups might be over before you realize they’ve started. Why the low write number on our 2017 Macbook Pro, we can’t tell you, but the Node Lite is still very fast. I also tested the Node Lite with Optane on a 2017 Macbook Pro. It performed well, though we’ve seen higher write numbers. Intel’s drives have had mild conflicts with Macs before. See my article on NVMe over Thunderbolt in Macworld. Note that you don’t need to pay $1,500 for this type of performance, Samsung’s 970 Pro (available via Amazon and reviewed here) and 970 EVO (available on Amazon and reviewed here), as well as WD’s Black NVMe (available on Amazon and reviewed here) are all viable, as well as far less expensive alternatives. You’ll get the same kind of throughput, though slightly slower seeks and performance with smaller files. Though the Node Lite with Optane is expensive, its looks are a hoot, and the 905P is an superb performer with 10X the lifespan of NAND-based SSDs. There’s also the dedicated DisplayPort port that the HighPoint RocketStor 6661A lacks. If money is no object, it’s killer. On the other hand, the plain Node Lite, and especially the 6661A with a cheaper drive inside, are more within reach of the average user. This is about as good as it gets in external storage, with a full x16 PCIe slot, bold red looks, and a DisplayPort output. Sold in this iteration with the wonderfully fast and long-lived Intel 905P Optane SSD.